True Grit, the remake of the 1969 original starring the legendary John Wayne in his only Oscar-winning performance and a retelling of the 1968 Charles Portis novel, is simply another solid effort by Joel and Ethan Coen (No Country for Old Men). In the best possible way, the Coens have crafted a bare bones western tale of vengeance, retribution, and redemption with a top notch cast from top to bottom. I was surprised by how much subtle, nuanced, seemingly unintentional but deliberately written comedy there is in true quirky Coen fashion. True Grit hits all the right notes of your modern telling of a western. The interactions between characters and absurdist moments of delight shine with basic yet thrilling storytelling at its finest. 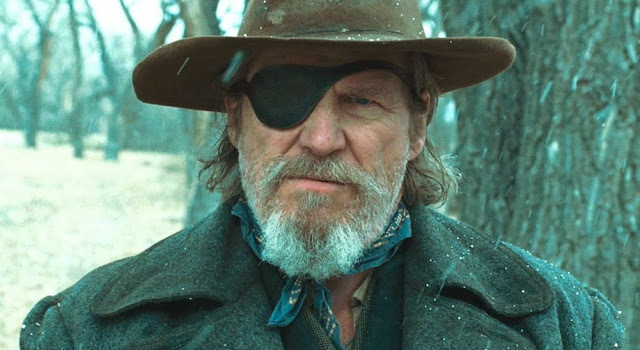 The Dude, Jeff Bridges (Tron: Legacy, The Big Lebowski) himself re-teaming with the Coens, takes over from Wayne as the one-eyed haggardly drunkard U.S. Marshal Ruben "Rooster" Cogburn with another great performance that fills the screen with great flair. Matt Damon shows up to steal most scenes he is in with a strangely aloof but hilarious performance as tough but quirky Texas Ranger (Don't call me Shia) La Boeuf. Hailee Steinfeld as the 14-year old Mattie Ross on a Kill Bill style trail of revenge is sharp as a knife. She holds the screen well even with her diminutive stature amongst Bridges and Damon, who create great tension evoking screwball comedy as a trio of true misfits. Steinfeld's narration and framing of the plot serves the picture admirably as she carries the story forward outwitting her costars. Her interactions with her older male counterparts are pitch perfect as she more than holds her own. Showing up to duel with our heroes is Josh Brolin (No Country for Old Men, Milk) in markedly treacherous fashion in a small role, but Barry Pepper (Flags of Our Fathers) really shines in a nice part as one of the film's villains. His is nasty and cold in a great, oddly illuminating way. The cast really shines with the sharp, basic dialogue executed with perfect timing and momentum. The film is beautifully composed with all the Coen brothers cinematic hallmarks. Cinematographer Roger Deakins frames each shot with basic yet effective composition as Carter Burwell's score shapes the picture's tone to the tee. True Grit is another solidly tight effort in the Coens' filmography. It captures the story well for a new generation as an interesting and worthy take on a classic western story that rests on the fine performances of its talented cast.